Justin himself sent this in for listening last week...it's a solo record for a track called "Rescue" from a few years back. He's since gone on to his current project the D.Evolution.Aires a three piece based out of Seattle. 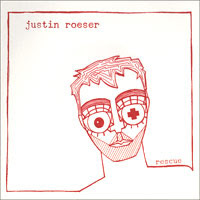 A-Side "Rescue" (original version from lost at zero) has a heavy dub electronic beat and some close mic'd acoustic that goes straight for the groove with a fingerpicking country and robotic handclap beat. That's a nice combo. It's like a double tapped hollow body of an acoustic, might not be a machine at all, but that future sound with these country roots...I could have really heard Elliot Smith going in this direction. It makes it that much more heatbreaking. Like Sonny and the Sunsets, it's a contemporay take on that Townes Van Zandt style. He's got as much to say here, and the dub step beat is taking a chance that people should be down for. Justin is singing as close to the mic as possible; breathy and slightly distorted. This thing is insanely clear, crystal and loud, changing that melody measure by measure to freestyle solo all over it in a very controlled way. Some kind of violin sound breaking in over this. It's a great combination that's over way to fast. The B-Side has two different versions, "Rescue house version" (featuring the horn dogs) is making the A-side a little bit clearer, I guess there's always been this kind of stuff in mind for this track. Almost going Squirrel Nut Zippers here with that kind of ska... Zoot suit sound. all instrumental with a clarinet taking the place of the vocal, that must be the horn dogs. An almost jazzy slow organ demo button rhythm, the high hat sound taking control. "Rescue with the en council" is crazy jazzy and bigger sounding, the vocals now almost like a Jicks B-side, a crazy idea to rework thhis song two new ways on the B-side. You get an idea of the kind of talent at work here able to arange this thing multiple completely different ways, but then I'm also asking myself, why stop there? Screen printed art right on the sleeve, on white vinyl. Blank center label, get it from interpunk distro.